A good interior designer understands the connection between designing and ergonomics. They will apply ergonomic principles to all designs whether working with commercial or residential property. Ergonomics is a type of science that focuses on ways to close the gap that exist between humans and the world in which we live. When applied to interior design, it simply helps to make the design more user-friendly. As a result, the space becomes more useful. You’ll notice an increase in productivity and it helps to create a safer environment for everyone occupying the structure. The first step in creating an ergonomic interior design is making sure you have enough space to accommodate your needs. If you’re cramped and crowded, you feel uncomfortable and it’s difficult to work or relax whichever the case may be. For example, when designing an office space you have to make sure there is enough room for all of the equipment and for the staff to work comfortably. In a residential home, you need enough room to move around freely, have enough furnishing to be comfortable and to have adequate storage space. Otherwise, everything will begin to feel cluttered and before long, you’ll start feeling uncomfortable and very unhappy with your design. We specialize in space planning and implementation here at J. Design Group and your project will receive special attention from our professional designers. Our experts have years of experience working with both residential and commercial property and we’re here to help. 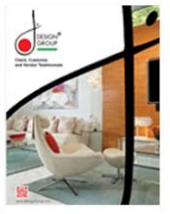 So give us a call to learn how we can help you create the perfect interior design using ergonomic principles. Since the ergonomic design focuses on creating a space that meets all of your needs while providing maximum comfort, customizing everything is also very important. People come in all shapes and sizes and your interior design needs to accommodate all users no matter how tall or short they may be. For residential homes, you need to customize everything from the kitchen cabinets to the furniture. For example, if the main cook barely stands five foot tall, you need a kitchen design that makes it easy for that person to reach the cabinets and counters comfortably even if everyone else is much taller. A female of small stature would find it difficult sitting on a large sofa because her feet wouldn’t touch the floor if she tried to sit all the way back. However, a six-foot male would be uncomfortable on a small sofa suited for a person of smaller stature. This is why you need to choose custom pieces when creating an ergonomic design. All furnishings need to match the size of the person using it the most to increase productivity and comfort.